These crispy nuggets are worth nibbling—and a great way to use leftover quinoa. Kick the sauce up a notch with a dash of Sriracha, if you like. Garlic powder is great here, as it evenly distributes garlic flavor without having to worry about any mincing or the garlic burning in the oven. It’s also important to chill the quinoa, so it adheres to the chicken. 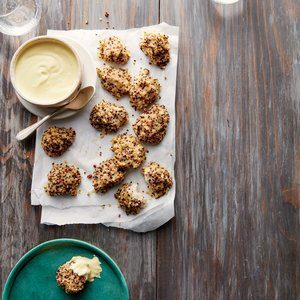 Rice flour keeps these nuggets gluten-free, but you can use whole-wheat or all-purpose instead. Sprinkle chicken with salt and pepper. Coat a parchment paper-lined baking sheet with cooking spray. Combine flour, cheese, and 1/2 teaspoon garlic powder in a shallow dish. Combine buttermilk and egg in another dish. Place quinoa in a third dish. Dredge chicken in flour mixture. Dip in egg mixture; dredge in quinoa. Arrange chicken in a single layer on prepared pan. Coat chicken with cooking spray. Bake at 425°F for 15 minutes or until done, turning once. Combine mayonnaise, yogurt, honey, mustards, and remaining 1/4 teaspoon garlic powder. Serve with nuggets.